calum is using Smore newsletters to spread the word online. The Preamble to The Bill of RightsCongress of the United Statesbegun and held at the City of New-York, onWednesday the fourth of March, one thousand seven hundred and eighty nine.THE Conventions of a number of the States, having at the time of their adopting the Constitution, expressed a desire, in order to prevent misconstruction or abuse of its powers, that further declaratory and restrictive clauses should be added: And as extending the ground of public confidence in the Government, will best ensure the beneficent ends of its institution.RESOLVED by the Senate and House of Representatives of the United States of America, in Congress assembled, two thirds of both Houses concurring, that the following Articles be proposed to the Legislatures of the several States, as amendments to the Constitution of the United States, all, or any of which Articles, when ratified by three fourths of the said Legislatures, to be valid to all intents and purposes, as part of the said Constitution; viz.ARTICLES in addition to, and Amendment of the Constitution of the United States of America, proposed by Congress, and ratified by the Legislatures of the several States, pursuant to the fifth Article of the original Constitution. The Bill of Rights: A TranscriptionThe Preamble to The Bill of RightsCongress of the United Statesbegun and held at the City of New-York, onWednesday the fourth of March, one thousand seven hundred and eighty nine.THE Conventions of a number of the States, having at the time of their adopting the Constitution, expressed a desire, in order to prevent misconstruction or abuse of its powers, that further declaratory and restrictive clauses should be added: And as extending the ground of public confidence in the Government, will best ensure the beneficent ends of its institution.RESOLVED by the Senate and House of Representatives of the United States of America, in Congress assembled, two thirds of both Houses concurring, that the following Articles be proposed to the Legislatures of the several States, as amendments to the Constitution of the United States, all, or any of which Articles, when ratified by three fourths of the said Legislatures, to be valid to all intents and purposes, as part of the said Constitution; viz.ARTICLES in addition to, and Amendment of the Constitution of the United States of America, proposed by Congress, and ratified by the Legislatures of the several States, pursuant to the fifth Article of the original Constitution.Note: The following text is a transcription of the first ten amendments to the Constitution in their original form. 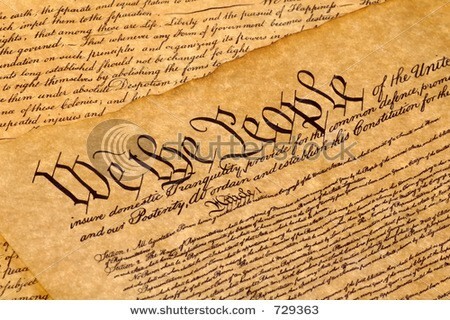 These amendments were ratified December 15, 1791, and form what is known as the "Bill of Rights. "Amendment ICongress shall make no law respecting an establishment of religion, or prohibiting the free exercise thereof; or abridging the freedom of speech, or of the press; or the right of the people peaceably to assemble, and to petition the Government for a redress of grievances.Amendment IIA well regulated Militia, being necessary to the security of a free State, the right of the people to keep and bear Arms, shall not be infringed.Amendment IIINo Soldier shall, in time of peace be quartered in any house, without the consent of the Owner, nor in time of war, but in a manner to be prescribed by law.Amendment IVThe right of the people to be secure in their persons, houses, papers, and effects, against unreasonable searches and seizures, shall not be violated, and no Warrants shall issue, but upon probable cause, supported by Oath or affirmation, and particularly describing the place to be searched, and the persons or things to be seized.Amendment VNo person shall be held to answer for a capital, or otherwise infamous crime, unless on a presentment or indictment of a Grand Jury, except in cases arising in the land or naval forces, or in the Militia, when in actual service in time of War or public danger; nor shall any person be subject for the same offence to be twice put in jeopardy of life or limb; nor shall be compelled in any criminal case to be a witness against himself, nor be deprived of life, liberty, or property, without due process of law; nor shall private property be taken for public use, without just compensation.Amendment VIIn all criminal prosecutions, the accused shall enjoy the right to a speedy and public trial, by an impartial jury of the State and district wherein the crime shall have been committed, which district shall have been previously ascertained by law, and to be informed of the nature and cause of the accusation; to be confronted with the witnesses against him; to have compulsory process for obtaining witnesses in his favor, and to have the Assistance of Counsel for his defence.Amendment VIIIn Suits at common law, where the value in controversy shall exceed twenty dollars, the right of trial by jury shall be preserved, and no fact tried by a jury, shall be otherwise re-examined in any Court of the United States, than according to the rules of the common law.Amendment VIIIExcessive bail shall not be required, nor excessive fines imposed, nor cruel and unusual punishments inflicted.Amendment IXThe enumeration in the Constitution, of certain rights, shall not be construed to deny or disparage others retained by the people.Amendment XThe powers not delegated to the United States by the Constitution, nor prohibited by it to the States, are reserved to the States respectively, or to the people.Amendments 11-27Note: The capitalization and punctuation in this version is from the enrolled original of the Joint Resolution of Congress proposing the Bill of Rights, which is on permanent display in the Rotunda of the National Archives Building, Washington, D.C. The Emancipation ProclamationJanuary 1, 1863 A TranscriptionBy the President of the United States of America:A Proclamation.Whereas, on the twenty-second day of September, in the year of our Lord one thousand eight hundred and sixty-two, a proclamation was issued by the President of the United States, containing, among other things, the following, to wit:"That on the first day of January, in the year of our Lord one thousand eight hundred and sixty-three, all persons held as slaves within any State or designated part of a State, the people whereof shall then be in rebellion against the United States, shall be then, thenceforward, and forever free; and the Executive Government of the United States, including the military and naval authority thereof, will recognize and maintain the freedom of such persons, and will do no act or acts to repress such persons, or any of them, in any efforts they may make for their actual freedom. "That the Executive will, on the first day of January aforesaid, by proclamation, designate the States and parts of States, if any, in which the people thereof, respectively, shall then be in rebellion against the United States; and the fact that any State, or the people thereof, shall on that day be, in good faith, represented in the Congress of the United States by members chosen thereto at elections wherein a majority of the qualified voters of such State shall have participated, shall, in the absence of strong countervailing testimony, be deemed conclusive evidence that such State, and the people thereof, are not then in rebellion against the United States. "Now, therefore I, Abraham Lincoln, President of the United States, by virtue of the power in me vested as Commander-in-Chief, of the Army and Navy of the United States in time of actual armed rebellion against the authority and government of the United States, and as a fit and necessary war measure for suppressing said rebellion, do, on this first day of January, in the year of our Lord one thousand eight hundred and sixty-three, and in accordance with my purpose so to do publicly proclaimed for the full period of one hundred days, from the day first above mentioned, order and designate as the States and parts of States wherein the people thereof respectively, are this day in rebellion against the United States, the following, to wit: Arkansas, Texas, Louisiana, (except the Parishes of St. Bernard, Plaquemines, Jefferson, St. John, St. Charles, St. James Ascension, Assumption, Terrebonne, Lafourche, St. Mary, St. Martin, and Orleans, including the City of New Orleans) Mississippi, Alabama, Florida, Georgia, South Carolina, North Carolina, and Virginia, (except the forty-eight counties designated as West Virginia, and also the counties of Berkley, Accomac, Northampton, Elizabeth City, York, Princess Ann, and Norfolk, including the cities of Norfolk and Portsmouth[)], and which excepted parts, are for the present, left precisely as if this proclamation were not issued. And by virtue of the power, and for the purpose aforesaid, I do order and declare that all persons held as slaves within said designated States, and parts of States, are, and henceforward shall be free; and that the Executive government of the United States, including the military and naval authorities thereof, will recognize and maintain the freedom of said persons. And I hereby enjoin upon the people so declared to be free to abstain from all violence, unless in necessary self-defence; and I recommend to them that, in all cases when allowed, they labor faithfully for reasonable wages. And I further declare and make known, that such persons of suitable condition, will be received into the armed service of the United States to garrison forts, positions, stations, and other places, and to man vessels of all sorts in said service. And upon this act, sincerely believed to be an act of justice, warranted by the Constitution, upon military necessity, I invoke the considerate judgment of mankind, and the gracious favor of Almighty God. In witness whereof, I have hereunto set my hand and caused the seal of the United States to be affixed. Done at the City of Washington, this first day of January, in the year of our Lord one thousand eight hundred and sixty three, and of the Independence of the United States of America the eighty-seventh. By the President: ABRAHAM LINCOLN WILLIAM H. SEWARD, Secretary of State. American Revolution was the struggle of thirteen American colonies against Great Britain. The term American Revolution also includes the American War of Independence, and resulted in the formation of the United States of America.Causes of the American RevolutionThe Stamp Act: The Stamp Act, which was passed in 1965, was Parliament&apos;s first serious attempt to assert governmental authority over the thirteen American colonies. It was an act for granting and applying certain stamp duties, in the British occupied American colonies. The main purpose of these taxes was to help Britain pay for the troops stationed in North America, for British victory in the Seven Year&apos;s War. Not only the British colonies in America, but even the British merchants and manufacturers opposed the act, as the exports to the colonies were threatened by colonial economic problems exacerbated by the tax.The Townshend Acts: The Townshend Acts were a series of acts passed in January 1767, by the Britain Parliament. These acts primarily included the Revenue Act of 1767, the Commissioners of Customs Act, the Vice Admiralty Court Act, the Indemnity Act and the New York Restraining Act. The sole purpose of this act was to raise revenue in American colonies and establish the precedent that the British Parliament had the right to tax them. The Townshend Acts met with a huge resistance from the colonies, thus prompting the occupation of Boston, by British troops in 1768.The Tea Act and the Boston Tea Party: The Boston Tea Party was one of the key events which led to the growth of American Revolution. It was an outcome of the Tea Act imposed by British Parliament to restore the East India Company&apos;s full refund on the 25% duty imposed for importing tea into Britain. It also permitted the company to export tea to the American colonies on its own account and led to a number of protests from the colonies. On December 16, 1773, a group of colonists boarded the three shiploads of taxed tea in Boston and destroyed the tea by throwing it into Boston Harbor. The event became famously known as the Boston Tea Party.Other Causes: There were various other acts which prompted the people in British American colonies to revolt against the British Parliament. Amongst these were the Sugar Act, the Quebec Act and the Boston Port Bill. According to the Boston Port Bill, Boston Harbor was closed to all ships till Bostonians repaid the British East India Company, for damages caused in the Boston Tea Party.Course of the RevolutionIn 1772, Samuel Adams created the first Committee of Correspondence and within a year the committee led to dozens of similar discussion groups throughout the colonies. These isolated groups also came together to facilitate the exchange of ideas, provide invaluable information and organize colonial voices of opposition. In 1774, The Continental Congress was formed after the Boston Tea Party and Intolerable Acts. By 1775, colonial resentment in many cities and towns caused the organization of volunteer militias, who began to drill openly in public common areas. On April 19, 1775, a British commander dispatched troops to seize an arsenal of colonial militia weapons stored in Concord. The British arrived in Concord only to be ambushed by the Concord militia in the battle, famously known as the War of Lexington and Concord. It was a success for Americans as more than 270 were killed from the British troops, compared to approximately 100 Americans. In June 1775, the Battle of Bunker Hill was fought outside Boston in which the British ultimately emerged victorious. 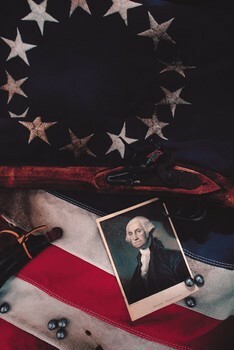 However, they suffered over 1,000 casualties, prompting British officials to take the colonial unrest far more seriously than they had taken previously.Aftermath of the RevolutionThomas Jefferson, Benjamin Franklin and John Adams were some of the people who played an important role in the American Revolution. The revolution was followed by the Revolutionary War, an assemblage of many events like the Battle of Saratoga (1777), France and United States form Franco-American Alliance (1778), entrance of Spain in the war against Britain (1779) and the Peace of Paris signed to end war (1983). Ending the U.S. War of Independence, The Treaty of Paris was signed in 1983. However, independence day in the U.S. is celebrated on Fourth of July, the date on which America was declared independent in 1776 .The revolution had a strong impact on the thirteen colonies of America, Great Britain, Ireland and France. It influenced the liberal thought flow throughout the American colonies. The last British troop departed from New York in November 1783, leaving the nation independent and to be ruled by its own government.